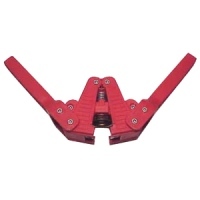 Good quality twin lever capper. Makes light work of crown capping homebrew beer bottles. Simply place a crown cap between to the two handles. Then place the crown cap over the beer bottle and push down on the handles. Continue pushing until the crown cap is firmly sealed around the mouth of the beer bottle.